Although Samsung’s most recent quarter has investors concerned as to their growth prospects in smartphones, the recent launch of the Galaxy S5 portends a brighter future for Samsung and their suppliers, including Qualcomm and Synaptics. The S5 is the best launch Samsung has seen in over a year. Unlike the launch of the S4, which boosted demand for the S3 and iPhone 5, the S5 launch seems to have honestly grabbed consumer attention. 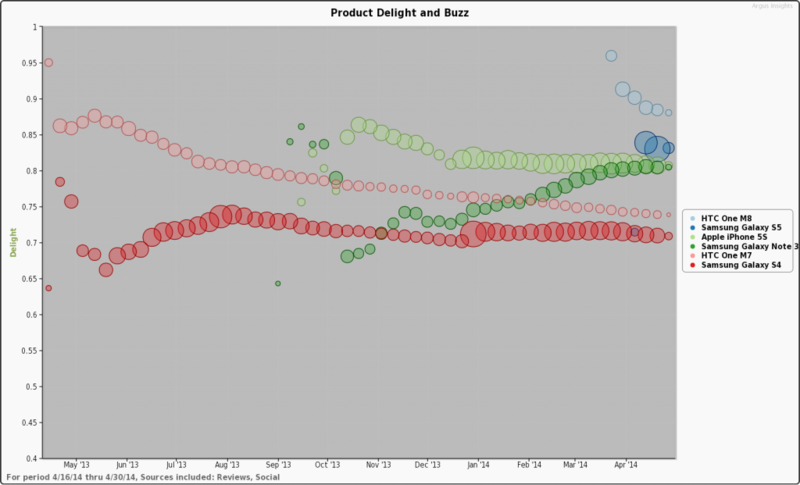 Our traditional delight and buzz metrics show the S5 doing well across multiple US and Canadian Retailers, with an oddly rocky start at Best Buy. The new HTC One M8 is perceived as a better handset but the adoption has not been as high as Samsung for HTC’s new flagship. Both are impacting demand for Apple’s iPhone 5S as these new flagships prove to be competitive alternatives. Later this week we’ll look at why this is as we dive deep in to what consumers are loving (and hating) about these new handsets. Compared to the Galaxy S4 launch, Samsung’s Galaxy S5 is doing much better, even beating out the iPhone 5S! People really do like dem apples! iPhone Sell Through Likely To Increase in Q1	Momma knows best! What is the best gift for Mother’s Day?